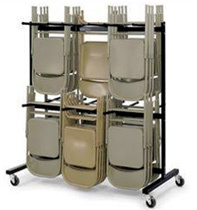 The Mormon church (LDS) has many non-Mormons deceived about their own LDS beliefs. When the mannerly, clean-cut Mormon missionaries come to our doors, the following is what they believe, but won't readily divulge to the new, potential converts. What you are about to read comes from some of the most authoritative sources in the LDS Church. There are three Gods—the Father, Son, and Holy Ghost—who, though separate in personality, are united as one in purpose, in plan, and in all the attributes of perfection (MD, p. 317). Three separate personages—Father, Son, and Holy Ghost—comprise the Godhead. As each of these persons is a God, it is evident, from this standpoint alone, that a plurality of Gods exists (MD, p. 576). At his Second Coming, "the Lamb shall stand upon Mount Zion, and with him a hundred and forty-four thousand, having his Father's name written on their foreheads" .... These 144,000 are Gods .... (MD, p. 546). All men in pre-existence were the spirit children of God our Father, an exalted, glorified, and perfected Man (MD, p. 751). Joseph Smith said: "God himself was once as we are now, and is an exalted man, and sits enthroned in yonder heavens! ... I am going to tell you how God came to be God. We have imagined and supposed that God was God from all eternity. I will refute that idea, and take away the veil, so that you may see .... (MD, p. 321). Therefore we know that both the Father and the Son are in form and stature perfect men; each of them possesses a tangible body, infinitely pure and perfect and attended by transcendent glory, nevertheless a body of flesh and bones (AOF, p. 38). ... there is "a God above the Father of our Lord Jesus Christ .... Hence if Jesus had a Father, can we not believe that he had a Father also?" (MD, p. 322). Implicit in the Christian verity that all men are the spirit children of an Eternal Father is the usually unspoken truth that they are also the offspring of an Eternal Mother .... that man is the "offspring of celestial parentage," and that "all men and women are in the similitude of the universal Father and Mother, and are literally the sons and daughters of Deity (MD, p. 516). Christ was begotten by an Immortal Father in the same way that mortal men are begotten by mortal fathers (MD, p. 547). Behold, I am Jesus Christ. I am the Father and the Son (AOF, p. 75). Kolob means "the first creation." It is the name of the planet "nearest to the celestial, or the residence of God" (MD, p. 428). Those who commit the unpardonable sin are doomed to Gnolom—to dwell in hell, worlds without end. As they concoct scenes of bloodshed in this world, so they shall rise to that resurrection which is as the lake of fire and brimstone. Some shall rise to the everlasting burnings of God; for God dwells in everlasting burnings, and some shall rise to the damnation of their own filthiness, which is exquisite a torment as the lake of fire and brimstone (MD, p. 316). All women are daughters of God because of their pre-existent birth as female spirits (MD, p. 179). The millions who pass to the spirit world without receiving an opportunity during mortality to hear the truths of salvation will receive their chance subsequent to what men call death (MD, p. 673). But under certain circumstances there are some serious sins for which the cleansing of Christ does not operate, and the law of God is that men must then have their own blood shed to atone for their sins. Murder, for instance, is one of these sins (MD, p. 92). When the plans for creating and peopling the earth were under discussion in heaven, Lucifer sought to destroy the free agency of man by obtaining power to force the human family to do his will, promising the Father that by such means he would redeem all mankind so that not one of them should be lost. This proposition was rejected, while the original purpose of the Father—to use persuasive influences of wholesome precept and sacrificing example with the inhabitants of the earth, then to leave them free to choose for themselves—was agreed upon; and the one to be known as the Only Begotten Son was chosen as the chief instrument in carrying the purpose into effect (AOF, pp. 49,50). We learn from the revealed word that Satan was once an angel of light, then known as Lucifer, a Son of the Morning; but his selfish ambition led him to aspire to the glory and power of the Father, to secure which he made the pernicious proposition to redeem the human family by compulsion; and, failing in this purpose, he headed an open rebellion against the Father and the Son, drawing a third of the hosts of heaven into his impious league (AOF, pp. 56,57). Here, then, is eternal life—to know the only wise and true God; and you have got to learn how to be gods yourselves, and to be kings and priests to God, the same as all gods have done before you, namely, by going from one small degree to another, and from a small capacity to a great one; from grace to grace, from exaltation to exaltation, until you attain to the resurrection of the dead, and are able to dwell in everlasting burnings, and to sit in glory, as do those who sit enthroned in everlasting power ... (MD, p. 321). If it had not been for Joseph Smith and the restoration, there would be no salvation. There is no salvation outside The Church of Jesus Christ of Latter-day Saints (MD, p. 670). The true gospel of Jesus Christ was restored to earth in the last days through the instrumentality of Joseph Smith. It is found only in The Church of Jesus Christ of Latter-day Saints (MD, p. 334). The President of The Church of Jesus Christ of Latter-day Saints holds the keys of salvation for all men now living because he is the only one by whose authorization the sealing power of the priesthood can be used to seal men up to salvation and exaltation in the kingdom of God. (D. & C. 132:7.) (MD, p. 411). But the Lord in His mercy provided for the reestablishment of His Church in the last days, and for the last time; and prophets of olden time foresaw this era of renewed enlightenment, and sang in joyous tones of its coming. This restoration was effected by the Lord through the Prophet Joseph Smith, who, together with Oliver Cowdery, in 1829, received the Aaronic Priesthood under the hands of John the Baptist; and later the Melchizedek Priesthood under the hands of the former-day apostles, Peter, James, and John (AOF, p.185). The final struggles between Nephites and Lamanites were waged in the vicinity of the Hill Cumorah, in what is now the State of New York, resulting in the destruction of the Nephites as a nation, about 400 A. D. The last Nephite representative was Moroni, who, wandering for safety from place to place, daily expecting death from the victorious Lamanites, wrote the concluding parts of the Book of Mormon, and hid the record in Cumorah. It was this same Moroni who, as a resurrected being, gave the records into the hands of Joseph Smith in the present dispensation (AOF, pp. 235,236). Thus the Indians were Jews by nationality (MD, p. 33). He [Adam] sat in the council of the gods in the planning of the creation of this earth, and then, under Christ, participated in the creative enterprise .... Adam (with the exalted title of Michael the Archangel) led the hosts of the righteous in the war in heaven. (Rev. 12:7-9.) ... holds the keys of salvation over all the earth (MD, pp. 16,17). An archangel is a chief angel. Michael (Adam) is the only one so designated in the scriptures proper (MD, p. 51). Adam is known as the Ancient of Days (MD, p. 34). At this council, all who have held keys of authority will give an account of their stewardship to Adam (MD, p. 21). The early brethren of this dispensation taught that the Garden of Eden was located in what is known to us as the land of Zion, an area for which Jackson County, Missouri, is the center place (MD, p. 20). Adulterers shall be cast down to hell to suffer the vengeance of eternal fire; and their eventual destiny—after suffering the torments of the damned until the second resurrection—shall be that of the telestial kingdom (MD, pp. 23,24). The most important things that any member of The Church of Jesus Christ of Latter-day Saints ever does in this world are: 1. To marry the right person, in the right place, by the right authority; and 2. To keep the covenant made in connection with this holy and perfect order of matrimony—thus assuring the obedient persons of an inheritance of exaltation in the celestial kingdom(MD, p. 118). Endowed with agency and subject to eternal laws, man began his progression and advancement in pre-existence, his ultimate goal being to attain a state of glory, honor, and exaltation like the Father of spirits. During his earth life he gains a mortal body, receives experience in earthly things, and prepares for a future eternity after the resurrection when he will continue to gain knowledge and intelligence. (D. & C. 130:18-19.) This gradually unfolding course of advancement and experience—a course that began in a past eternity and will continue in ages future—is frequently referred to as a course of eternal progression .... In the full sense, eternal progression is enjoyed only by those who receive exaltation. Exalted persons gain the fulness of the Father; they have all power, all knowledge, and all wisdom; they gain a fulness of truth, becoming one with the Father. (MD, pp. 238, 239). That exaltation which the saints of all ages have so devoutly sought is godhood itself. Godhood is to have the character, possess the attributes, and enjoy the perfections which the Father has. It is to do what he does, have the powers resident in him, and live as he lives, having eternal increase (MD, p. 321). They were denied bodies, were cast out onto the earth, and thus came the devil and his angels—a great host of sons of perdition. Those in this life who gain a perfect knowledge of the divinity of the gospel cause, a knowledge that comes only by revelation from the Holy Ghost, and who then link themselves with Lucifer and come out in open rebellion, also become sons of perdition. Their destiny, following their resurrection, is to be cast out with the devil and his angels, to inherit the same kingdom in a state where "their worm dieth not, and the fire is not quenched" . . . . Joseph Smith said: "All sins shall be forgiven, except the sin against the Holy Ghost; for Jesus will save all except the sons of perdition (MD, p. 746). After their resurrection, the great majority of those who have suffered in hell will pass into the telestial kingdom; the balance, cursed as sons of perdition, will be consigned to partake of endless wo with the devil and his angels (MD, p. 350). Thus, for those who are heirs of some salvation, which includes all except the sons of perdition (D. & C. 76:44), hell has an end (MD, p. 351). According to the one and only proven source of God's word (the Holy Bible), salvation is only found in the virgin-born Son of God, who shed his holy blood for every sin. When a person turns from their own sins and extends a trusting-submitting faith in the Lord Jesus for salvation he gets instantly forgiven and becomes a child of God (Acts 20:21; 3:19; 1 Jn. 5:12,13). A faith in Jesus that brings one into the kingdom of God will always produce good fruit and holy living (Mt. 7:19; Heb. 12:14; James 2:14-17). Any person can experience all of this without any church to mediate for them, especially the LDS Church, which is filled with so many doctrinal myths. Unfortunately, however, such is not the LDS beliefs! After initial salvation, one must endure to the end to enter God's kingdom (Mt. 10:22) and be faithful to Christ not to be hurt by the second death (Rev. 2:10,11). We must hold firm to the end to share in Christ (Heb. 3:14). In the Kingdom, the saints will never reach Godhood, but will always be a son (Rev. 21:7). Not only isn't the LDS Church needed for salvation, as they claim for themselves, but they are spreading many deadly untruths about Almighty God, the Lord Jesus, the devil, those who go to Hell, how to be saved, life beyond the grave, God's word, etc. Also, it is easy for one to claim to be a prophet, like Joseph Smith has, but it is another thing to prove it. Smith has made numerous false prophecies, which is impossible for God's true prophets to make (Dt. 18:21,22), and is, therefore, a deceiver who has misled many, just like the kind the Lord Jesus warned would come (Mt. 24:11). Dear reader, please do not be deceived by the sincerity of, or the friendly way, the Mormon people might treat you. The LDS beliefs (their teachings) are not God's truth. Remember, what you believe and do now in this lifetime will affect you throughout all eternity. Therefore, learn the message of the Bible and commit yourself to the one, true, living God, who has power to have you thrown into Hell forever. The candidacy of Mitt Romney for the most powerful office in the world opens up the Mormon church to public scrutiny as never before. This gives the American electorate an unparalleled opportunity to investigate the character of the LDS church — including its unique culture, from which Mormons tend to derive most of their controversial beliefs. As we pointed out in a previous piece, the church's authoritarian society discourages members from understanding the church's own canon — beginning with the Bible — and produces, in turn, a body of relativistic beliefs widely held among the membership, beliefs at odds with the biblical gospel of Jesus of Christ. The result is an institutional church, and culture, best described as "enigmatic" — hard to decipher. In this installment of our series on Mormonism, we take a close look at the nature of the LDS church from the vantage point of God Himself, as recorded in the church's own canon. What does God say about "Mormons," according to LDS scripture? Mormons are fond of quoting a passage in the LDS canon in which God declares the LDS church "the only true and living church upon the face of the whole earth, with which I, the Lord, am well pleased, speaking unto the church collectively and not individually" (D&C 1:30). Members often use these words — recorded in 1831, shortly after the church's founding — to justify their belief that they alone belong to the church of Jesus Christ, and other professing Christians do not. This view leads Mormons to assume that only members of the Mormon church can be saved, and others must convert to the church if they are to have the same assurance. Entirely absent from such thinking is the biblical teaching that each individual must work out his or her own salvation "with fear and trembling" — as Paul wrote — "for it is God which worketh in you" (Phil. 2:12), and that the role of Christ's church is to aid each individual in doing so, not guarantee it, upon the saving "doctrine of Christ." Also absent from such thinking is the last phrase of the passage — which contains a qualifier: individual members of the LDS church cannot, themselves, necessarily claim to be members of Christ's true church, nor can they necessarily claim to please Him by the way they live, even if the passage is accurate. The passage quotes God as saying He is "speaking unto the church collectively and not individually." Of course, non-Mormons dispute the authenticity of the above reference altogether. Most Christians also hold the view that no organized church can save anyone: only Christ can save — for He alone gave His life to make salvation possible for all, upon the terms He has set. Those terms — His eternal, biblical "gospel" — transcend organized churches, Christians generally believe, even one professing to be "the only true and living church upon the face of the whole earth with which the Lord is well pleased." Before we cite additional words of God regarding the LDS church, let's look at the biblical church of Christ, which offers insight to understanding what a church claiming to be His should be like in principle, and on what basis it would "please" Him. The New Testament makes clear that Jesus set in motion the foundation of His church during His ministry, and it became a vehicle for preaching His gospel, administering authorized rituals relating to conversion and membership, conferring authority, and providing fellowship and guidance for believers. The early church was comparatively simple: its central ritual was the "breaking of bread" (Acts 2:42); members willingly shared "all things" with each other "as every man hath need" (Acts 2:44-45); those given divine authority were to "feed" the church of Christ, not "being lords" over members, but "being ensamples to the flock" (1 Pet. 5:2); where "two or three [were] gathered together" in Jesus' name, He would be in their midst (Matt. 18:20); all members were to be "one body in Christ," joined together with "the same mind" (Rom. 12:5,16); the teachings of the church were to focus unerringly on the original gospel of Christ (Gal 1:8); and so on — with a warning that after Christ's death, "grievous wolves" would enter the church, "not sparing the flock," and from among the church leadership "shall men arise, speaking perverse things, to draw away disciples after them" (Acts 20:28-30). The LDS church's own Book of Mormon seconds the above view of the "true church of Christ." Throughout the book, faithful Christians are described as those who have individually "come unto Christ," repented of their sins, been baptized as a witness that they will obey God in all things, received a spiritual "rebirth" by the power of His Spirit, and put their trust alone in Jesus Christ — not in man, nor in the authorities of the church. Those willing to do so — much as the early converts in Acts, chapter 2 — were accepted among the community of fellow believers. Always, Christ — not an "institutional" church — is the focus of the book. In fact, there is no institutional church at all in the Book of Mormon, of the sort that resembles the extensively-controlling LDS church today — typified by manuals for seemingly everything, elaborate programs for seemingly everything, codified norms for seemingly everything, an elite bureaucracy that seeks to control seemingly everything, and enforced dependence on human authority from top to bottom, suggesting a church that is the most institutional entity on earth. 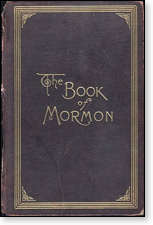 Like the New Testament church, the "Book of Mormon church of Christ" is simple, consisting of devout believers who have genuinely become converted to Jesus Christ (not to His church), in company with sincere servants of God who themselves are converted, and whose only desire is to lead others to be "born of God" as they themselves have been. At least, that's what the record shows. In the Book of Mormon, to be a true member of Christ's church meant to be fully dependent on Christ Himself; those dependent on the "arm of flesh" were characterized as imposters. Similarly, nowhere in the book is the church of Christ itself emphasized as essential to salvation as Mormons see the LDS church today. Instead, the church is described as the collective society of true believers who are saved directly by Jesus Christ, not by the church, its rites, or its leadership. This closely parallels how the Bible defines Christians. "A mighty change of heart"
Let me now share what a former LDS president said that coincides with the foregoing analysis — especially as it relates to the "true church" of God — then let's take a close look at God's words from the LDS canon that reveal what He thinks of the LDS church today, with which He can hardly be said to be "well pleased." 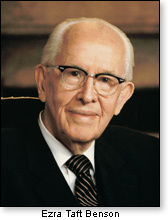 In 1989, the LDS church's most politically-conservative president, Ezra Taft Benson — who served as Eisenhower's Secretary of Agriculture and was church president during the Reagan years — issued a challenge to all LDS "members of record," inviting them to become "true members" of Christ's church. He did so in an article in the church's chief publication, the Ensign, titled "A Mighty Change of Heart" in October of that year. But the Lord defines a member of His kingdom in quite a different way. In 1828,...He said, "Behold, this is my doctrine — whosoever repenteth and cometh unto me, the same is my church." (D&C 10:67; italics added.) To Him whose Church this is, membership involves far more than simply being a member of record. Note the last sentence. Of the many millions of Mormons who are on the LDS records — and who thus believe they are part of Christ's true church — "thousands" have become truly converted to Christ and been accepted by God as members of the true church, in the estimation of President Benson. That's profound, to say the least. It contradicts numerous cultural presumptions common in the LDS church, and places squarely on the individual — not on the church — the onus for demonstrating acceptance into the "body of Christ." And for this cause have I said: If this generation harden not their hearts, I will establish my church among them. Consider these words closely. D&C 10 in the LDS canon quotes Jesus as saying His church already existed at the time He was preparing to establish the LDS church. In other words, there were already true Christians, fully converted to Him, in 1828 — two years before the LDS church was founded — contrary to what many Mormons believe. Jesus then assures those already accepted by Him as part of His church that by establishing His church anew, He was not destroying His pre-existing church, only "building it up." Hence, true Christians need not fear. That's what it says. Never mind the thinking of most Mormons — who believe, without doctrinal grounds from their own canon, that the early church of Christ was entirely destroyed by corruption following the deaths of the original apostles. ...I will also bring to light my gospel...and shall bring to light the true points of my doctrine, yea, and the only doctrine which is in me. And this I do that I may establish my gospel, that there may not be so much contention; yea, Satan doth stir up the hearts of the people to contention concerning the points of my doctrine; and in these things they do err, for they do wrest the scriptures [that is, the Bible] and do not understand them. Yea, if they will come, they may, and partake of the waters of life freely. Behold, this is my doctrine — whosoever repenteth and cometh unto me, the same is my church. And now, behold, whosoever is of my church [by virtue of true conversion to Christ], and endureth of my church to the end, him will I establish upon my rock, and the gates of hell shall not prevail against them. Such words shift the burden of assessing membership in Christ's "true" church from an institution to Christ Himself, and to individual, professing Christians — each of whom must truly "come unto Christ," not only to be saved, but to be counted by Christ as belonging to His church. Unfortunately, as our previous piece emphasized, the Church of Jesus Christ of Latter-day Saints seems not to know — or appreciate — such plain words from its own canon. 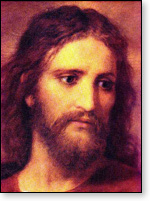 Rather than focus on the need for all persons to rely solely on Jesus Christ, be genuinely "born again" through His Spirit, and thereby attain true conversion to Christ and His gospel, the church emphasizes the need for members and non-members to rely on church leaders, who — we are told, "will never lead the church astray" — an undoctrinal assertion that dilutes and confuses the message of the church. The result is an understandable perception among observers that "Mormonism" is a non-Christian cult. For this perception, Mormons have no one to blame but themselves — that is, the culture of the church — if the Christian world "misunderstands" them, views them with suspicion, considers them pagan, likens them to Islam, and so on, as many Christians do. This phenomenon reveals the most vulnerable weakness of the institutional LDS church: Mormons, themselves — at least those inclined to yield to the immense social and institutional pressure to "put their trust in man," rather than rely alone on Jesus Christ as commanded by the church's canon. It also sets the stage for examining what God says about the culture of the church — His view of the culturally-driven perversion of His eternal gospel by a society of self-professed "saints" — as we read next. The whole church under God's "condemnation"
According to a definitive section of the Doctrine & Covenants, God declares the entire membership of the Mormon church "under condemnation" for "treating lightly" the saving gospel of Jesus Christ. For shall the children of the kingdom pollute my holy land? Verily, I say unto you, Nay. Plainspoken words, hard to dispute. Whether a person accepts the Doctrine & Covenants as scripture or not — or the Book of Mormon — the above condemnation of the culture of the LDS church, attributed to God Himself, cannot be watered down to mean anything but what the words clearly say: LDS society as a whole is guilty of disregarding the "new covenant" of Christ's saving doctrine, and as a result, the LDS church is cursed. When he was president of the church, Ezra Taft Benson often cited the above passage and expressed his desire that the divine condemnation of the church might be lifted. God's wholesale condemnation of LDS culture above was recorded September 1832, a year after initially proclaiming the church "pleasing" to Him. Twenty months later — in June 1834 — another section of the D&C was recorded, Section 105, officially declaring similar words of judgment regarding the general culture of the church. Behold, I say unto you, were it not for the transgressions of my people, speaking concerning the church and not individuals, they might have been redeemed even now. And my people must needs be chastened until they learn obedience, if it must needs be, by the things which they suffer. Here again, in the church's official canon, we find strong words of the Lord condemning LDS culture — this time pronouncing Mormons as a group "full of all manner of evil." Such words may seem harsh, but Mormons consider them to be from God's own mouth. Similarly, in the Book of Mormon, we read an account of Jesus' thoughts on the modern LDS church. Although parts of this passage could be interpreted broadly to apply to any Christian church today that loses sight of the gospel message, other elements suggest (in light of Mormons' belief that they alone are the "holy church of God") that the passage foretells the condition of the LDS church itself. And I know that ye do walk in the pride of your hearts; and there are none save a few only who do not lift themselves up in the pride of their hearts, unto the wearing of very fine apparel, unto envying, and strifes, and malice, and persecutions, and all manner of iniquities; and your churches [congregations], yea, even every one, have become polluted because of the pride of your hearts. O ye pollutions, ye hypocrites, ye teachers, who sell yourselves for that which will canker, why have ye polluted the holy church of God?... (emphasis added). And if it so be that the church is built upon my gospel then will the Father show forth his own works in it. Behold, vengeance cometh speedily upon the inhabitants of the earth, a day of wrath, as day of burning, a day of desolation, of weeping, of mourning, and of lamentation; and as a whirlwind it shall come upon all the face of the earth, saith the Lord. Since Mormons consider the Lord's "house" to refer exclusively to the LDS church (and no other denomination), the passage reflects much the same "condemnation" already laid out plainly in the LDS canon. Are Mormons generally aware of the above verses, you may wonder. Most appear not to be — or if they are aware, they are oblivious to them. If a member happens to quote such words in LDS gatherings, by the way, they can expect obvious displeasure, even censure, from fellow members and local leaders. Such words are anathema in the church. They are also God's — according to the church's officially-adopted canon. We don't wish to offend our conservative Mormon friends and supporters, especially those who are sincere in their desire to follow Jesus Christ, by citing disturbing words from their own official canon. 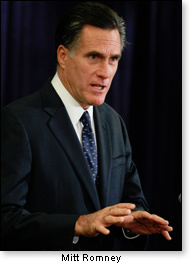 At the same time, the candidacy of one of Mormonism's "best and brightest" for the Presidency of the United States invites open investigation of the LDS church by a world left largely in the dark by the often-secretive — and nearly always inscrutable — Church of Jesus Christ of Latter-day Saints, with its exceptionally servile, authoritarian, self-contradictory culture. We've just examined God's recorded words from the LDS canon regarding the church. If those words are authentic, they reveal an enigmatic society that merits not more power and influence in America, or in the world — but decidedly less. As far as Mitt is concerned, there's no understanding him apart from the problematic culture we've just discussed — from which he takes his basic values, beliefs, and priorities as a "cultural Mormon." Considering what's at stake this election, voters therefore have a duty to weigh Mitt upon biblical principle, "vetting" him thoroughly before entering the voting booth. They also have a duty to examine his actions in the political arena, especially regarding social issues — looking not only at "what he says, but what he does," to paraphrase D&C 84:57 from the LDS canon.